Western European markets mostly prefer ready-to-eat Hass avocados, while Eastern European, Greek and Italian customers still often go for green skin avocados, such as the Fuerte and Pinkerton. The popularity of Hass avocados is expected to grow. The biggest challenge in the coming years will lie in the sourcing. Three years ago, not a single avocado was imported by China and now the country receives thirty containers per week. Importers are preparing for a worldwide shortage of avocados in the coming years. The Chilean season came to an end in February with good volumes. Afterwards, in March and April, there is always a gap in the market, which is normally filled by Spain and Israel with high price; however, productions in these countries have been limited due to the heat wave recorded in May last year. Last month marked the arrival of the first South African avocados. South African avocados were hit by hail and the supply would have been been 25% lower, but new plantings have made up the deficit to bring estimates to around the same as last year. June is normally the peak month for avocados in terms of arrivals, and this will still be so this year, but while in 2014 we saw prices in June of up to 5-6 Euro, last year it was no longer the case and importers expect prices this year not to fall under the 7.50-8 Euro per kilo. A Belgian importer affirms that the impact of the terrorist attacks on sales can still be felt in the capital of the country. There are fewer tourists in Brussels, which takes a toll on the market. Avocado prices are currently high, ranging between 14 and 18 Euro, depending on the variety, quality and maturity. The supply consists mainly of Fuerte and Hass from Peru from Mexico. Due to the high prices, sales concentrate mostly in the gourmet sector. While avocados are increasingly popular in many European countries, the Dutch market was a little a little behind. This trend has now been reversed, as Dutch consumers are learning to appreciate the fruit. Avocados are also known as the new tomato. The UK market has grown by 30 percent YOY and suppliers cannot keep up with the rising demand. At present, there are Spanish, Moroccan and Israeli avocados on the market. Moreover, there is some supply from Peru, but the quality of these avocados is not up to the highest standards. A trader says: "Five years ago, we had never imagined we would sell so many avocados, and that applies not only to the British market." The exchange rate is unfavourable for British importers. The British retail chain M&S recently presented an extra-large avocado which is only available for two weeks. The growing consumption in Sweden is being driven by two factors, according to a trader: effective promotions via social media and the publication of articles on the health benefits of the fruit. Also, Mexican tacos are popular and in Sweden people like to make their own guacamole. The market is doing well. Demand is growing, despite the high prices. One importer explains he is concerned about the danger of growers harvesting too early to take advantage of the high prices. Prices are also high in Norway; nevertheless, demand is on the rise. Last year, imports grew by 10 percent compared to 2014. Over the past 25 years, avocados have gone from being just a niche product in the hospitality industry to becoming a popular supermarket product. The supply comes largely from Spain and some of the fruit arrives also via the Netherlands. The demand for avocados remains stable in Italy. Even though the fruit is still considered a niche product, traders believe there is potential for growth. The market share of avocados is growing steadily and Italians are also learning to identify quality and the different varieties. The largest consumer groups are Italians who want to live healthy, as well as vegetarians. At present, imports are arriving from South Africa and South America. The Sicilian season, which overlaps with Spain and Israel, has already finished. The supply is low, so prices are high. While prices normally stand at around 4 Euro per kilo, they are currently twice as high. On the wholesale market in Bologna, the avocados currently available come from Chile and Peru, but avocados are a sensitive product. With high temperatures, sales are low. The Sicilian season kicks off in September/October and lasts until April/May. With the introduction of new varieties, growers expect to extend the season until June. The Spanish domestic production is falling and the market will soon switch to imports from Peru, South Africa, Colombia, Mexico and Kenya. In this period, there are shortages on the market which drive prices up. Those supermarkets which didn't sign enough contracts are struggling to fill the shelves. The Peruvian supply is slow and South Africa will benefit from it. Traders expect Mexico to gain a solid foothold in the coming years because of the stable quality of its production. Colombia has also shipped significant volumes to the Iberian Peninsula. According to traders, avocados are the only fruit recording an upward trend both in terms of volume and prices. The Israeli export sector is one of the largest in the world. Israel is in the top 10, with annual exports totalling 50,000 tonnes. This corresponds to 6.2 percent of the global avocado trade. Furthermore the domestic market is also large. The average per capita consumption stands at 5 kg per year, making Israel one the largest consumers worldwide. Of the 80,000 tonnes produced annually, about 35 to 40 percent is sold on the domestic market. Europe is the main export destination. During the winter months, Israel has the largest share in this market. Demand is growing steadily and this is boosting the expansion of the acreage, with about 250 new hectares per year. One of the biggest advantages for the growers comes from the cultivation of different varieties at different production stages, which results in a longer export season. The most popular variety is still the Hass, with 35 percent of the existing acreage and 60 percent of all new plantings. Other varieties grown are mostly green, such as the Ettinger, Fuerte, Pinkerton, Arddit, Nabal and Arad. These varieties do particularly well in the domestic market, although there is also a shift towards the Hass. The Mexican avocado industry has a great future, according to a trader. The country's large production capacity and its climatic and geographical advantages make it possible to supply the fruit all year round. Prices for exports to the US have declined in recent years, but the downward trend seems to be stabilising. While Europe generally pays lower prices than the US, things have changed this year. At the moment, prices in both markets are at the same level. In recent years, Guatemala has made huge investments in avocado crops. Production has grown by 42 percent in the last two years. Because of changes in the cycles, the season could be extended from December to March to an almost year-round program. Some export tests have been carried out, with shipments to the Netherlands. This year, the volumes are large enough for exports to grow. Exporters aim to fill the gap in the product's supply in July and August. Last May, Costa Rica closed its borders to imports from Mexico, which had dramatic consequences for the market, with reported price increases of up to 90 percent. Importers had to set their eyes on Chile, which managed to cover 35 percent of the disappeared Mexican supply. Moreover, there has been some smuggling from Panama. The Colombian authorities are working on a free trade agreement with the United States. For now, exports go only to the EU. Furthermore, coca plantations are being cleared and replaced with avocado crops. The government is backing this development. The harvest in Peru has been delayed by one month by El Niño. However, the country's prospects remain positive; demand is high, as are the prices. The government proposed a new quality control to guarantee the quality of its exports. The most exported variety by far is the Torre, which is slightly larger than the Hass and with a smaller pit. The UK and France are the markets where the variety is most demanded. The harvest takes place between September and November, with exports taking place also during those months. The rest of the year, the production goes to the domestic market. The supply of Brazilian avocados to the European market is on the rise. This season, a total of 280 containers are expected to be shipped to Europe. The peak is reached in April and last until the second week of May. In the coming years, the acreage is planned to expand. A company reports to have plans to plant 200 new hectares. Strong investments are being made in the cultivation of avocados. A company reports to have plans to go from 700 hectares to 2,000 hectares in the coming years. In total, the country has 15,500 hectares; an acreage which is expected to increase by 500 hectares annually in the coming years. Estimates for the coming season point to a production totalling 12.8 million 4 kilo boxes, which is about 250,000 boxes more than last year. Despite the rainfall recorded in the north of the country, there are still concerns for the coming season. The heat is good for the quality, but some extra rain will also be needed in the short term. The bulk of the country's exports go to Europe, but shipments are also made to the Middle East and Africa. Moreover, we are look for new markets in the Far East. Traders see a growing trend in all these markets. The Kenyan season, which usually lasts from March to July, has recently started. While torrential rains caused some problems for the sector, the production is good and demand shows an upward trend. The size of the Hass avocados is small, also because growers are harvesting early to take advantage of the good prices. The main market is Europe, particularly the Netherlands. A trader hopes to benefit from South Africa's downward prospects. The US imports avocados from all producing countries. A Mexican exporter, therefore, expects the US market to set the international price trends. The Mexican supply is keeping the prices of the Californian production under control. Estimates suggest that California's harvest this year will be greater than in 2015. Due to the greater supply, prices are below the level recorded last year. On 12 April, Californian avocados (Hass, 32s) cost between $ 23.25 and $ 25.25, while Mexican avocados (Hass, 32s) stood between $ 20.25 and $ 23.25. In the coming months, import volumes will fall, namely in the summer months. This lower supply will be absorbed by California. Towards the summer, demand will continue to rise. The Canadian market prefers avocados from Mexico. About 90 percent of the fruit imported by the country comes from this country. Last year, Canada's imports from Mexico totalled 63,000 tonnes. Imports have grown by 27 percent over the past two years. Canadians annually consume 250 million tonnes of avocados. The Australian avocado market has developed particularly well in the past few years. During the summer months, the demand often exceeds the available supply, resulting in good prices for the growers. The downside is higher supermarket prices, which can potentially be a deterrent to consumers. 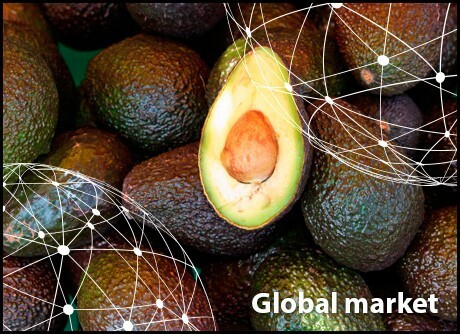 The market growth recorded by avocados is partly the result of the fruit's healthy properties, but also to the successful promotions carried out in recent years. Also, avocados are available all year round. Besides the domestic production, there is also supply from New Zealand. Furthermore, the market has managed to respond to the wishes of the consumer. The sizes that are not popular are exported, which stimulates the domestic market. However, there are some concerns about imports from Chile, Peru and Mexico. The Government has said to be worried about the risks for the country's agriculture involved in the import of avocados from other countries, including Mexico. Southern China, namely the provinces of Guangzhou and Hainan, has a small avocado production. The planting remains limited and there is no commercial production. Avocados are becoming a popular import fruit, especially in the big cities on the East Coast. Mexico and Chile have access to the Chinese market, and last year, Peru received also permission to export. The Peruvian minister estimated China's potential at 50 million dollars. Ready-to-eat avocados are a novelty in the market, as they were only recently introduced. Investments are going to ripening facilities and to promotions to further develop this market. Every week, FreshPlaza and AGF.nl publish an overview of the market situation of a product in a global context. With these articles we aim to provide a view of a global market shrinking due to globalisation. Next time, ginger will be in the spotlight.